Once again, we’re approaching another trunk show here at the workroom, in collaboration with the City of Craft ladies. The Love & Rummage Trunk Show will be a little bit different than our previous shows, as we’ve asked our vendors to also go through their crafty closets and package up some vintage supplies and goodies, as well as making their special wares. I have a strong suspicion that many of them have a treasure-load of stuff and I can’t wait to browse through it. I’ll be profiling vendors every day up until the show, so I hope you drop by to take a peek at what’s in store. Today I’m super excited to introduce you to Margie Oomen of Resurrection Fern. 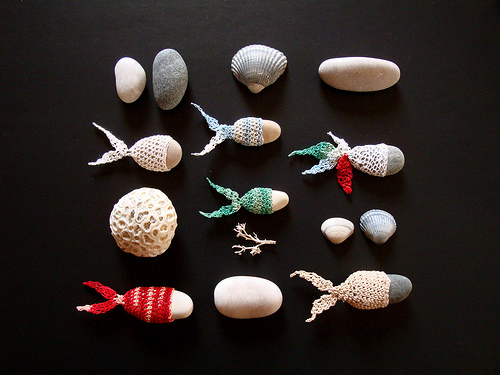 I first discovered Margie on flickr when I saw a picture of one of her crochet covered sea stones. The first thing I did was check to see if she had an etsy store, so that I could buy one. Alas, at the time she didn’t – but her etsy store opened recently and seems to be doing really well. If you want one of her stones, you have to be mighty quick, as they sell out shortly after being posted. I have a feeling the same will be true at the trunk show. Nature plays a big part in your work. How did the play between craft and nature develop for you? MARGIE : I have always been a nature girl and also a maker of things from a very young age but it seems only in the last year or so that the two have really become covalently bonded. I have been doing a great deal of reading and thinking about how we can do our part to help increase awareness of the effects of global warming and unregulated consumption on our little planet and what I came up with was the concept of helping people see and experience what it is that is worth saving. To put this more simply, I really want to do my part to motivate people to go out there in the woods, meadows, seashores or even there own backyards where they can then slow down, and see what nature is trying so desperately to show them in the hopes that it will motivate them and inspire them to be creative. Tell me the story behind your delightful crochet-covered rocks. MARGIE : The story started with me crocheting the “rock babies” which were two little smooth stones I half covered with crochet one day and then my daughter said they looked like little babies wrapped in blankets. I smiled and then decided to add very simple facial features with a permanent marker and thus they were christened the “rock babies”. 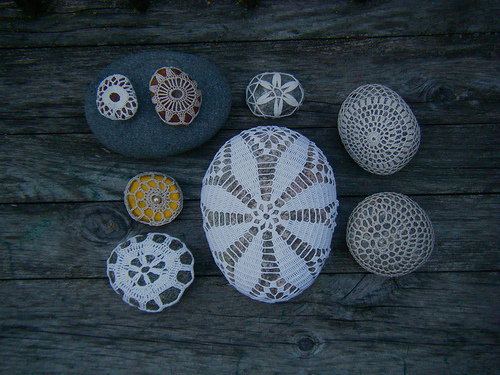 I loved the look of an eyelet fabric covered stone I saw on flickr made by Stephanie ( little bird ) and decided to crochet some lace like covers for some sea stones I collected on my summer vacation in Cape Breton. The rest is history. MARGIE : Nature is and always will by my greatest source of inspiration. I have made some great friendships through flickr and my blog and this creative community feeds and nourishes me everyday and also keeps me grounded. What was your worst crafting disaster? MARGIE : There is no such thing as a crafting disaster, they are only lessons to learn. Are you planning on selling some rummage at the show? MARGIE : I have been cleaning out my storage craft area and will have some vintage buttons, ribbons and trim and some vintage fabric bundles for sale and again a few surprises. I am not sure how all of this will fit in my vintage suitcase but maybe it will be a magic suitcase like Mary Poppins carpet bag. MARGIE : The best Valentine’s gift would be to spend the day snowshoeing or cross country skiing in the forest with my husband and having a winter picnic with a small fire. Our hands, feet and noses might get cold but our hearts would be toasty warm. Wow – her work is fantastic. I wish there were some covered stones in her Etsy store… I would be unable to resist! Oh I loved learning more about one of my FAVORITE bloggers!!! Thanks so much for posting this! i love these!!! they’re so beautiful! karyn, are we going to be fighting over rocks?…or with them? Oh, Karyn! I am SOOOOO excited that Resurrection Fern will be at the sale! I have been coveting her covered stones forever — and I always miss them on etsy. I’ll be lining up at your store on the day of the show! Oh man, those rocks are pretty sweet. Sounds like I better get there early!